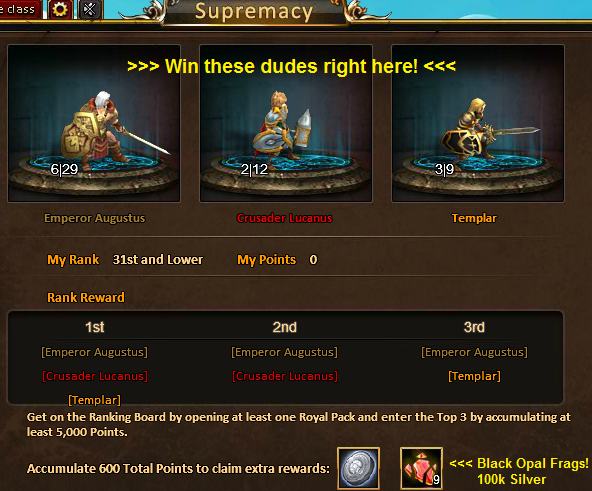 Supremacy allows you to earn points by opening the new Royal Packs, which contain only Epic - Godlike ranked cards. Plus, you can also grab an extra 100k Silver and 9x Black Opal Fragments. 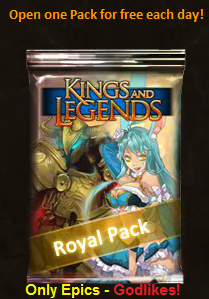 Open a free Royal Pack everyday the event is on. Extra Points can be gained by finding specific Legendary or Godlike cards. To enter Top 3 ranks, a minium of 5,000 Points must be accumulated. Cards opened from this Event do not count towards Kings Command, Only The Elite. Q. Is the extra SIlver and Black Opal Fragments always given for 600 Points? A. No. The points needed for the 100k SIlver and Black Opal Fragments = the No. of days of the event + 100 more. This means you will need to buy minimum 1x Royal Pack to be eligible foe them. Q. Do I get the Black Opal Fragments for each 600 Points, or only once per Event? Q: How often will the Supremacy event appear? A: About once a month. Q: Are the Awakenend Fragment prizes the ones used to enhance creatures, or are those Black Opal frags? A: The Awakened Fragments are the frags used to enhance non-Elite creatures, the race is the same as the race in the current Supremacy event (the race of the displayed cards). Q. What do I do with Black Opal Fragments?